The Sony Xperia XZ Premium goes all in with features that the company dabbled in with recent offerings, making it a worthy consideration for anyone that is willing to overlook the lack of a fingerprint reader and basically non-existent carrier availability in the States. It’s been a while since I’ve used an Xperia phone. While Lanh has done a great job reviewing them in the last year or so, I have had the pleasure of using the Xperia XZ Premium for the last couple of weeks. Though we have seen a number of iterations in a short amount of time because of the company’s tight release schedule, it still feels like returning to an old friend. This year, Sony has returned with a 4K capable display and all of the power that you would expect from the company you don’t hear from enough in the States. But does the latest and greatest from Sony stack up against the bevy of phones that we already have in 2017? Let’s find out in this review of the Sony Xperia XZ Premium. There is no shortage of Xperia devices, especially considering their release schedule over the past couple of years. It is almost as if the company is running out of different combinations of the alphabet’s last few letters. In this case, however, they have decided to add the term “Premium” into the mix. Unfortunately, it might not be the absolute best word to use for this phone’s design. The XZ Premium is definitely a looker, with a glass on glass design that sports a dark blue sheen in our review unit. This translucent color shines beautifully and makes for a very sleek device. However, the glass-all-over design is something that has been tried and true in the Xperia line, making this phone all too familiar especially to Sony fans. It doesn’t help that the glass back is a fiend for fingerprints, which smudge up the sheen all too easily after even just a short time of usage. Though the fingerprints are a regular occurrence with these glass phones, they are going to be even more common as users perform hand gymnastics all around the large device. Sony still doesn’t shy away from the large bezels found primarily at the top and bottom of the screen, making the phone taller than it should be – in a year of 18:9 aspect ratios and tall yet narrow displays, it is a bit flabbergasting to see that Sony just doesn’t know how to compact their handsets anymore. It makes us opine for the Xperia Compact phones, really. Despite all this, handling could be a whole lot worse. The flat top and bottom help rest the phone squarely on a balancing pinky (especially since the glossy back doesn’t take well to a PopSocket, but that’s my personal issue) and the rounded sides are good for a nice vice grip to keep the phone from slipping about. If it did slip, the phone could take a dip in the water without any problems – the Xperia XZ Premium comes with an IP68 rating so that it can keeps water and dust at bay. Sony has opted for an easily removable SIM and SD card tray that doesn’t require a tool – however, the SIM tray is a separate piece to this cover and is simply too fiddly for comfort. Below that is the power button that might not be like the large silver power buttons of old, but it is still a defining feature of the latest Xperia – the large and concave button cradles the thumb nicely, but alas does not include the fingerprint reader that other regions will be able to enjoy. By far, my favorite part of the Xperia XZ Premium design (and, indeed, Xperias since the beginning of the line itself) is the dedicated camera button that is nestled in the bottom right corner of the phone. Not only does it give an extra way of opening up the camera (just hold down) it functions completely like a proper shutter button complete with a halfway press for triggering focus. It is a small but significant addition that comes in handy for more picture taking situations that you may initially expect. Anyone that has followed my reviews shouldn’t be surprised – I am always a fan of extra inputs on smartphones and this is one big point for the XZ Premium. So the phone might be a bit unwieldy, but that large body compliments what is one of the most powerful display we have so far in a mobile phone. In the previous 4K toting Xperia device, the high resolution was only used when 4K content was detected – in this case, it is all 4K all the time. That comes with one huge caveats, however – and it might not surprise you to know it’s a content issue. Before we get to that, let’s get the specifications out of the way. This 5.5 inch display is 3840×2160 in total resolution, making for some of the sharpest rendering that we’ve ever seen on a phone display, covered in Gorilla Glass 5. Sony has injected much of its BRAVIA TV technology into this Triluminous display, as well. Those are a few different buzzwords to basically say that the display is pumping out some crazy colors which can be customized rather extensively in the display settings. You can change not only the color gamut mode but also the white balance of the display. The main issue in the display settings is the lack of any always-on or ambient display – this is a feature that has become commonplace for plenty of flagship phones and the lack of this level of screen convenience is noticeable. But let’s get back to the 4K resolution. For all intents and purposes, having the resolution turned up to 11 at all times makes this screen very enjoyable. There is upscaling that occurs when viewing anything below that high resolution, but that is where the BRAVIA capabilities come into play. Nothing looked overtly pixelated or blown up to the point of distraction. On the flip side, 4K native content looked absolutely wonderful on the Xperia XZ Premium. The issue is that there is so little 4K enabled content out there that the promises of such of a display turn out to be a concept rather than an ultimately essential feature. It takes quite a bit of sleuthing all throughout YouTube and then in Amazon Prime Video to get 4K native content to take advantage of the high powered screen. That said, one of the most enjoyable experiences I’ve had on the Xperia XZ Premium has been playing Final Fantasy IX for extended periods of time. Sharpness and color in the game have been top notch but there is plenty else powering the experience. The XZ Premium is another Snapdragon 835 enabled phone that comes with 4GB of RAM that is used to good effect mainly because of a slimmer Android skin. And I mean it – the Android iteration on this phone is one of the smoothest and snappiest that I have used in recent memory. While there are fewer bells and whistles in this version of the operating system, I never had any problems with having a lot of apps open and I already mentioned the great gaming experience. It is also clear that Sony took some liberties with the OS animations, making them very quick so as to give off the feeling of a really speedy user experience. Unfortunately, there a couple caveats regarding this version of Android on the XZ Premium – it is not only a skin of Android, but enough of a custom build that it has caused a few holes. NFC is included in the hardware stack but when I tried to pay for a few items using Android Pay, it complained that this version of Android is a custom ROM – this is enough to trigger its security features, making Pay inoperable. Quite the bummer when I did all that work just to have to take my wallet out anyway. I mentioned before the issue with the fingerprint reader – the sad part here is that I got to use it on an Asian unit back during Computex in Taipei, where I found it to work really well. It made perfect sense to wake the phone using the power button, at which point the phone would unlock because it recognized my thumb during the press. There have been a number of reports regarding why the fingerprint reader is again not a part of the western batch of devices, but basically its absence is sorely felt. As for the rest of the inclusions, the microSD card slot can be used as an extra SIM tray in most markets, bolstering the already included 64GB of onboard storage. In those large bezels that we’ve already lamented over lie stereo speakers for a good sound experience that is neither bad nor exceptional – though front facing speakers are always a plus, they don’t get very loud and the small grills keep the stereo sound from being stellar. Things change when headphones are plugged in, though – there are so many options for catering the audio experience that listening to anything from game audio to songs to podcasts is a treat. ClearAudio+ returns from previous Xperia editions and adds an easy way of boosting the sound if customizing it little by little is not preferred. There is even optional enhancement to make compressed audio sound more like lossless, called DSEE HX. And to round it all out, noise cancellation is built into the headphone jack when using a compatible headset. There is little to complain about with the audio experience in the Xperia XZ Premium. My review unit was used on the T-Mobile network without any problems whatsoever. All parties involved with calls were happy with the quality, and no dropped calls were observed. Data was especially great, as well, with LTE+ working to great effect during my time in New York and back home in Los Angeles. And finally, battery life is about as good as it could be with a 4K capable display. You would think that the XZ Premium would falter in the longevity department because it has to power so many pixels, but in my heavy usage it managed to be just about as good as current flagships touting Quad HD displays. 3.5 hours of SoT on this 3230mAh unit throughout an entire day of high usage is nothing to sneeze at given these circumstances, but it is still just average for the typical user’s workday. Stamina mode is available to dial back some of the high performance in order to keep the battery from conking out too soon, but in those dire moments Quick Charge 3.0 is still on hand to make sure that there is no problem getting the phone topped up whenever required. The dedicated camera button is not all that I enjoyed about the camera. On the contrary, there has been a lot to like about the high powered optic package. True to form (especially in the most recent Xperia phones), Sony packs in a 19MP sensor that can capture 4K video and super slow motion video at a whopping 960fps. Let’s talk about what everyone is really drooling over – the 960fps. Before building up to that highest setting, there are a few other modes available, such as recording at 120fps and adding in the slow motion in post, and one-shot super slow motion that takes a 5 second clip straight from the shutter press. The marquee feature is the 720p video recorded at normal speed, at which point the user has to tap the capture button at ‘the right moment’ in order to initiate the high frame rate. It’s not easy to find the perfect moment, but when you do, the results can be incredible. Just remember to use it in basically just broad daylight, as this mode is terrible in even mediocre lighting. On the topic of video, I used the Xperia XZ Premium as basically a vlogging camera during a couple days in Taipei and for plenty of other clips since then. Recording at 1080p yielded videos with good detail and enjoyable colors, but recording at 4K would yield even better results especially when they are finally rendered out in 1080. Which brings me to one of my main issues regarding the Xperia camera software – switching modes. There is a Manual mode that allows for a lot of finite control over the shot, and it is easy to get to that mode and video by swiping on the viewfinder. My main gripe is that the 4K video recording isn’t a setting in Video Mode, but rather a mode itself in the extra selection area. Having to move over to the extra modes just for a 4K video adds too much time to what should be a quicker process for a vlogger-type like myself. But overall the video experience has been quite good, and the same can be said for picture taking. Superior Auto is a great go-to place to get the best possible shot given the scene, and tapping on any portion of the viewfinder to focus the camera track that portion of the subject to mostly proper effect. While it is possible to customize the settings and shot using the Manual Mode (for forcing certain toggles like HDR), the Superior Auto is very reliable and yields the right photo most of the time. Pictures get a great amount of detail given the 19MP packed in, but color and exposure are also where they should be. Colors can use a little extra punch from time to time, but there were hardly any pictures that I was unhappy with. In some broad daylight shots, the entire photo seemed to be a little overexposed, though – this more than likely due to my tapping a darker area for focus, which the exposure compensation had to account for. But in lower light, the XZ Premium camera is only really hindered by the slower shutter speed that needs to compensate for the f/2.0 aperture. A slower shutter speed makes most small movements blur the photo just enough to have to redo the shot – this might be the only situation where the dedicated camera button is a bit of a hindrance, as well as the move to keep stabilization electronic and not optical. Portraits also get a little less love due to that slightly high aperture. There will be less of a depth-of-field bokeh effect compared other phones like the Samsung Galaxy S8, as a result. But when the detail is as high as it is, this is a small trade off. The same goes for the front facing camera, which is also plenty powerful at 13MP – it is a good performer without too many bells and whistles compared to its rear facing counterpart. As the top manufacturer of the world’s most common smartphone camera sensors, it is good to see that Sony is using their own hardware to good effect. It has taken a little while for them to get the software right, but in the XZ Premium there is very little to gripe about – Superior Auto is solid, settings are abundant, and video is fun to use. And finally for the software, a lighter edition of Android comes in the XZ Premium, especially when compared to LG and Samsung counterparts. There are few extras that are in one’s face off the bat, as the homescreens are simple, even use an app drawer button still, and use Google Now as the companion homescreen on the left. The main addition is a quick device-wide search function that is easily found when swiping down anywhere but the notification dropdown. Speaking of, the dropdown is also super familiar, with no significant additions even in the quick toggles. Sony’s own applications, however, fall into a rather common trap of redundancy against Google’s own ecosystem. The Xperia lounge brings users to a portal where Sony will push a lot of content your way, whether it be 4K video or applications that are supposedly “Xperia exclusives,” but many of this content is available in other ways and the exclusives are more like add-ons for some of the already Play Store ready equivalents. There is a Movie Creator which can come in handy if you wish to edit videos while mobile. But where there are a few issues are with apps like the Photos and Videos duo – these two separate the different pieces of content on the phone, captured on the camera or not, and feel a little unnecessary when Google Photos is already built in. And a News app by Sony isn’t a bad idea, but Google Now is an intrinsic part of the already complete user interface. We give Sony credit for not taking too many liberties with the Android software on the Xperia XZ Premium, though the rather common head scratching that accompanies a lot of software experiences is present here, as well. As I mentioned before, the software has been properly tweaked to be really fast, quickly animated, and it is lightweight enough to provide a breezy experience. Though this custom ROM for the West sacrifices the fingerprint reader and even Android Pay support, these are annoyances that we understand are not deal-breakers. The Sony Xperia XZ Premium will not be widely distributed on US carriers, which has been a thorn in the side of Sony’s presence in the States for a long time now. However, it is available for $799 on e-commerce channels for unlocked editions, and this includes places like Amazon and even Best Buy. For a 4K display, water resistance, a good camera, and even a dual-SIM slot, it’s a tad impressive that Sony keeps the XZ Premium competitively priced against the likes of current Samsung and LG flagships. And so, there you have it – the Sony Xperia XZ Premium. 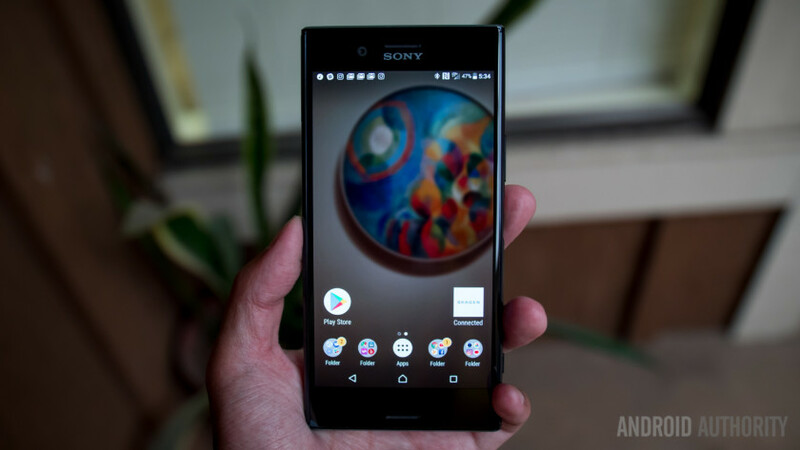 I have to say, it is really refreshing to come back to the Sony Xperia line after having such fond memories of the many that I reviewed in my earlier days here at Android Authority. And Sony has done a good job of keeping up with the competition – when you look purely at the phone in a vacuum. In the States, the lack of a fingerprint reader is a sore point that many will point out, but there are a lot else to love. A solid, even if all-too-familiar design quite literally makes it shine and a 4K display on a phone is a wonderful addition despite its lack of overall usefulness. It’s a matter of give and take with the Xperia XZ Premium, but for anyone that is a fan of Sony, this is a worthy upgrade from the previous edition – unless those six months are a little too short of a time for you to drop $800. For everyone else, this will hardly be a reason to think of Sony as a major player in the West – but you owe it to yourself to at least be aware of Sony and how their step-by-step evolutions might one day influence the rest of the market.